I think I found another way and it is a lot simpler than I thought. 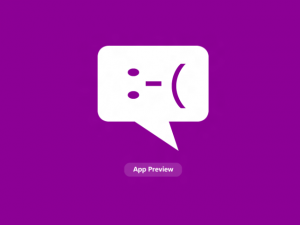 All you have to do is unpin the messaging app. Don’t uninstall it though because this will uninstall mail and calendar too. You might need to log on/off or reboot after you do this. Basically you can’t in the Release Preview. It’s kind of annoying. Every time I log into my Windows 8 PC it also logs me in to Facebook and sets my status as available. 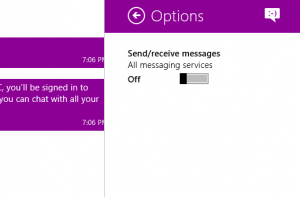 There isn’t any way to log out of Windows 8 Messaging. The only control Microsoft gives you is over your visibility. It’s not that I want to ignore everyone; it’s that I don’t want to be logged into chat unless I choose to do so. It’s already annoying enough that I get logged into Facebook from Skype too. There was a time when I was getting bombarded with Facebook messages on my Windows Phone, Windows 8, Skype, and Facebook.com! One person sent one message and it was sent everywhere. That had to stop. Right click Command Prompt and choose Run as administrator from the bottom. 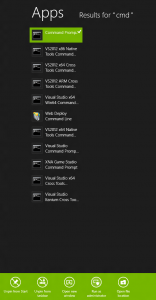 then right click the background of your command window then choose paste and hit enter. There you go. You are blocking the messaging service. This should work as long as they do not change the IP. If you want to revert back, run the Advanced Firewall and delete the rule we just created. 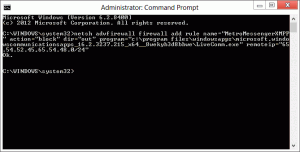 You can get to the Advanced Windows Firewall by running wf.msc from the start menu or command window. That will work too, the only problem is I still want my Facebook contacts, calendar, and newsfeed in Windows 8. I just don’t want to be logged in to chat. how to get back to normal please explain. I found a simple way to logout from facebook on windows 8. go to start and click people move your courser to top right , then click on microsoft account , put your password and microsoft email . now your microsoft account is login and facebook account get off. “If you want to revert back, run the Advanced Firewall and delete the rule we just created.”what is the name of the rule. I can’t find it. There is no MetromessangerXMPP. if you can’t find it, it was probably never successfully created. Had a lot of trouble figuring out how to turn off my messenger until I stumbled across this page. Thank you. However, just the fact alone that I needed to do EXTRA RESEARCH to SIGN OFF MY MESSENGER is one of many reasons why Windows 8 is terrible. I’m only using it because I have to for school. If it weren’t for that, I’d never even touch it. Sorry to hear that! Glad I can help. I have a hard time remembering that all apps share the settings charms to get into the options. After you do though, it’s much easier to access each app’s settings. Shall i go toCHANGE PC SETTINGS ? Be sure you are in the Messaging app. I updated the post. When you are in the app hit control + c for the charms bar, then settings, then options. Yah…. its so annoying, because I logged in my facebook account in my friend’s computer. Now, I can’t log out from his computer and he can’t log in to his computer. How to do now? go to the top right, click on Facebook, the manage your account online. scroll down to the bottom the click remove account completely. voila!